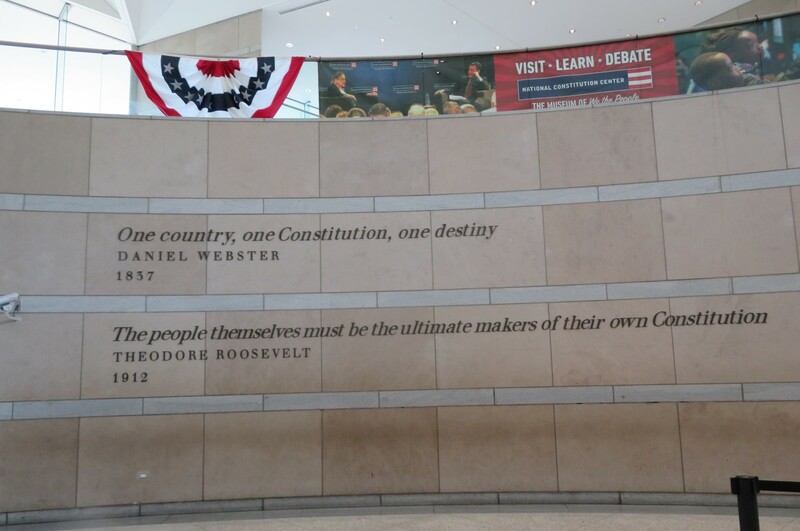 Our 2018 Road Trip, Part 30: Our Constitutional Sights « Midlife Crisis Crossover! Is the American version of democracy a viable system, or is a world where citizens love JFK more than Gerald Ford an utter travesty? YOU make the call! Among our nineteen official annual road trips, we’ve had a few experiences in which we found ourselves falling short of our goals, not quite exploring our targeted locations to the fullest, and promising ourselves to keep them in mind in case we had time in the future to call do-over. Some of the cities and states we’ve visited are extremely unlikely to see us return, for better or worse. 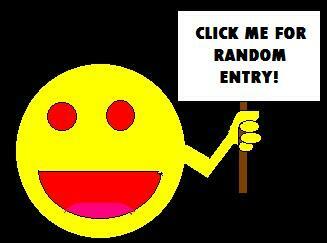 But we like the idea of arranging second chances where possible and merited. …and that’s the story of why our next several chapters feature our grand return to Philadelphia. 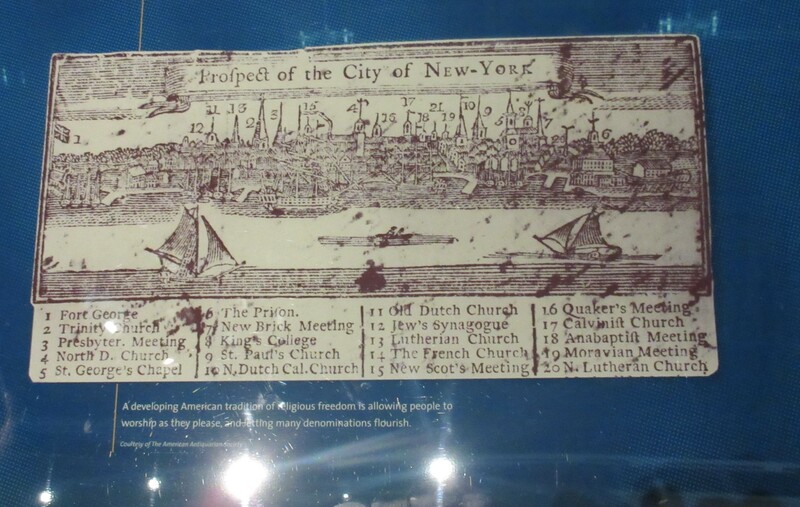 And what better way to dive into the original capital of the United States of America than to visit a giant museum dedicated to the Founding Fathers and some of their most important words that made America work? The building is this big, and yet I have no memory of spotting it in 2010 even though we walked a block away from it. 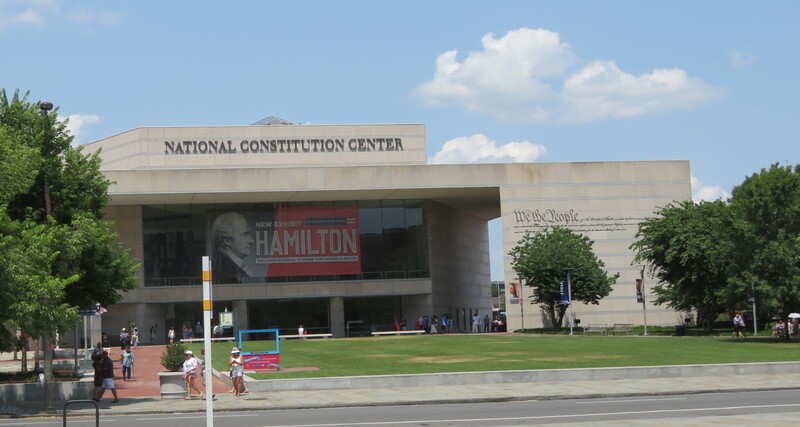 The National Constitution Center opened in 2003 at the north end of Independence Mall, the polar opposite of Independence Hall and the Liberty Bell Center. 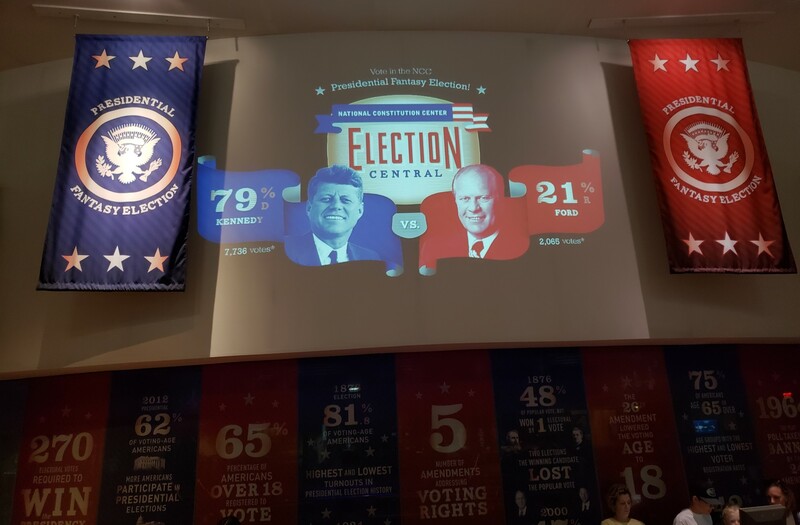 More than just a museum, the National Constitution Center also hosts speeches, discussions, and debates about Constitutional matters involving participants from all over the political spectrum, including at least three former U.S. Presidents. The Center is nonprofit and nonpartisan, except maybe to anyone touchy enough to think “Our Constitution is a good thing” is a terrible hot take. Either way it’s all about American civics in general, where they came from, and how they got where they are today, with stopovers for all the best Bill of Rights amendments. Entryway quotes from one Republican and one Whig. 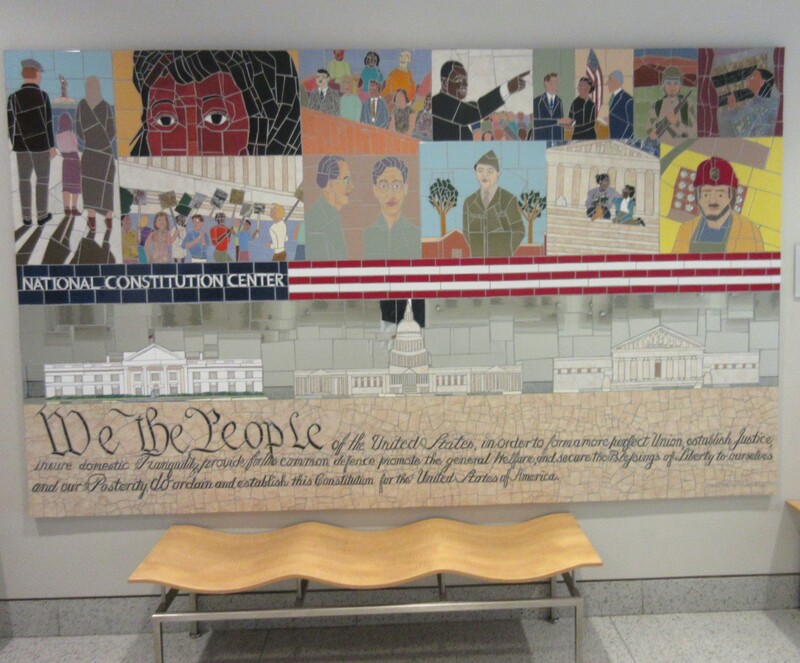 A “We the People” mosaic on the way in. 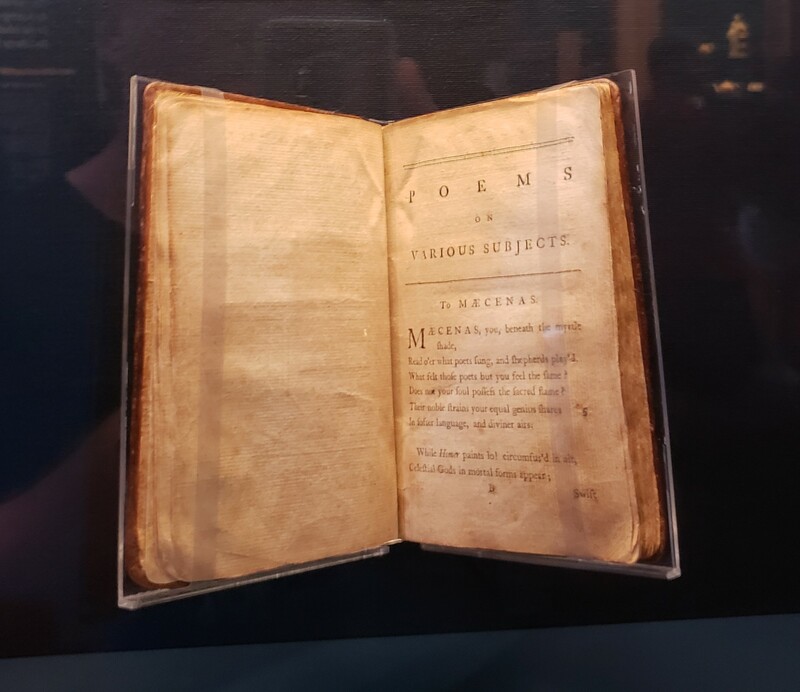 Preserved artifacts include this autographed 1773 copy of poet Phyllis Wheatley’s Poems on Various Subjects, Religious and Moral, in the section covering 1865’s 13th Amendment abolishing slavery. Wheatley, born in Africa but dragged to America as a child slave, was emancipated shortly after its publication. 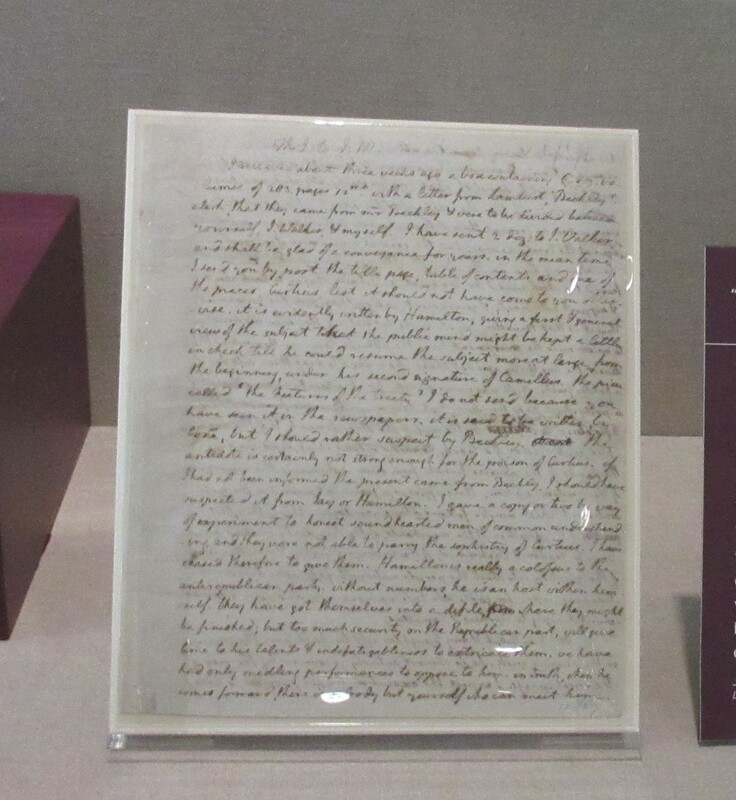 In this 1795 letter to Congressman James Madison, Virginia constituent and activist Thomas Jefferson (between elected jobs at the time) condemns the 1795 Jay Treaty as a disappointing sophomore follow-up to 1783’s all-time classic Treaty of Paris. Looking to exercise freedom of religion? Here’s a handy obsolete guide to New York houses of worship. Supreme Court dockets, for kids who’ve never seen or had to testify for one. 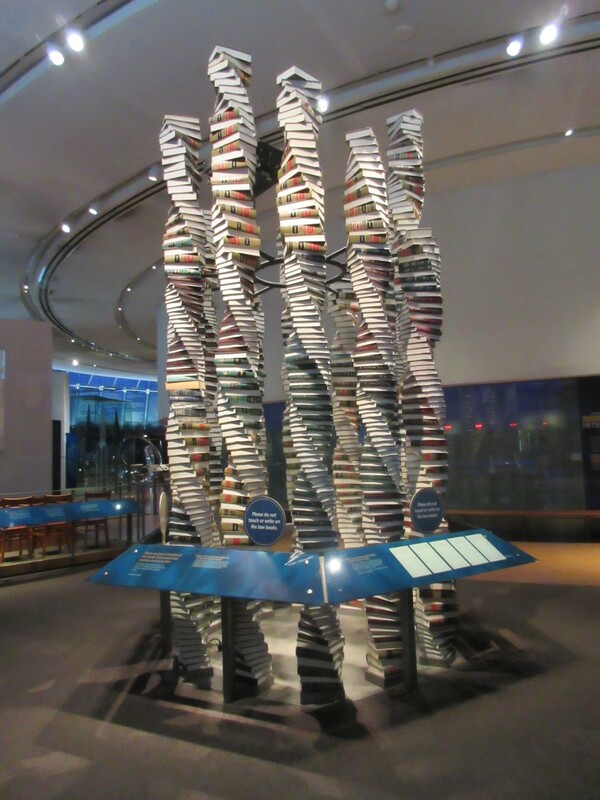 A rare intersection of art and law: a sculpture comprising stacks of “a fraction of” all the books out there containing American laws. This is why no lawyer in America knows every law ever in all fifty states. 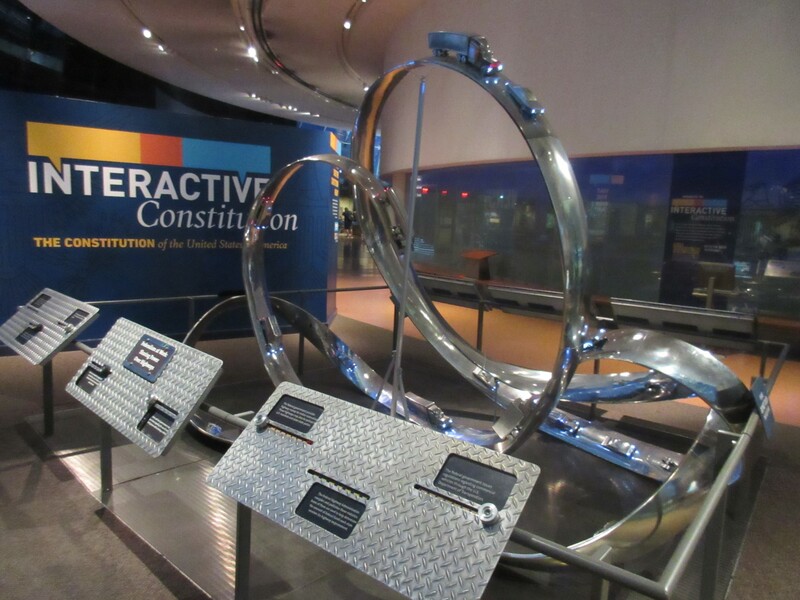 I didn’t get the Interactive Constitution racetrack. Something involving chain reactions and figurative domino effects, I’m guessing. 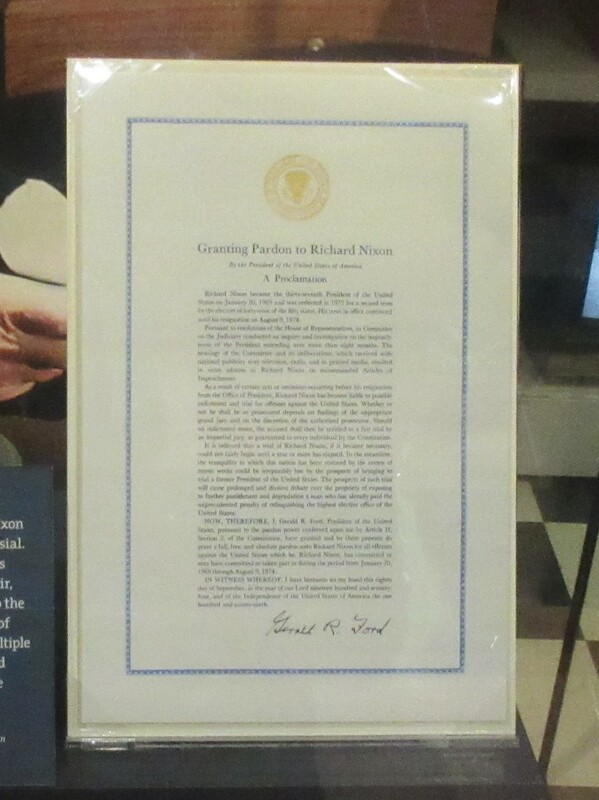 That time in 1974 when Gerald Ford granted a Presidential pardon (per Article II, Section 2 of the Constitution) to his predecessor Richard Nixon in hopes that it might help the country move on, forget anything ever happened, act like everything is fine, and hopefully catch the subtle implication that only guilty people can be pardoned. A bit too subtle, judging by the next few years’ election results. 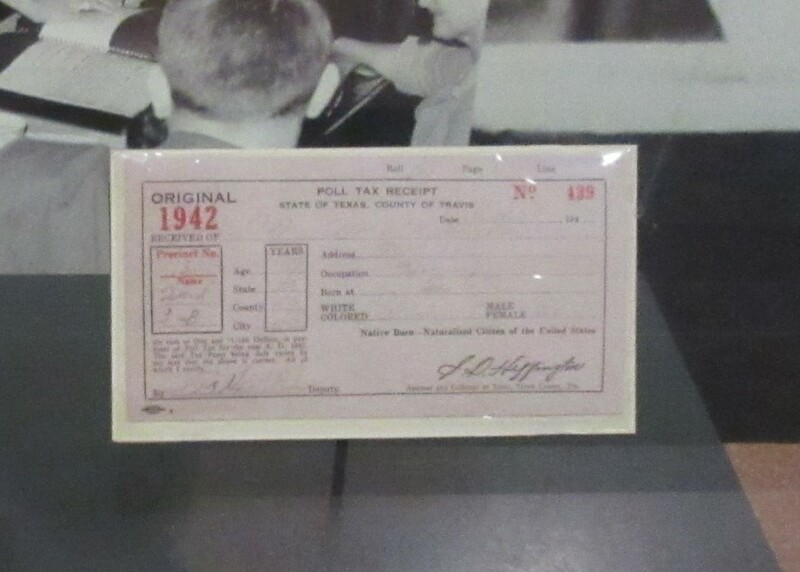 For fans of evil voter obstruction: a 1940s Texas poll tax receipt. Back in the day, several states used to suppress certain underprivileged voting blocs by charging citizens $1.75 or so to register to vote. 1964’s 24th Amendment abolished poll taxes nationwide, overriding Texas’ own state constitution, which was begrudgingly amended two years later after the Supreme Court cordially jumped down their throats. 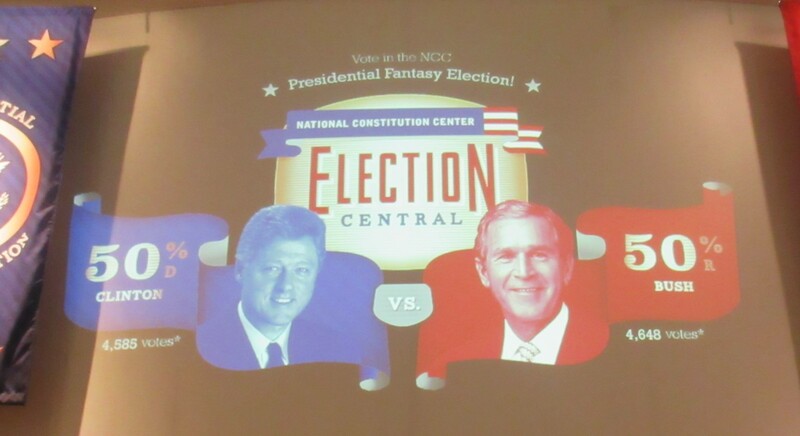 As you’d expect in a nation with voting in it, the subject of elections is a big deal at the National Constitution Center. 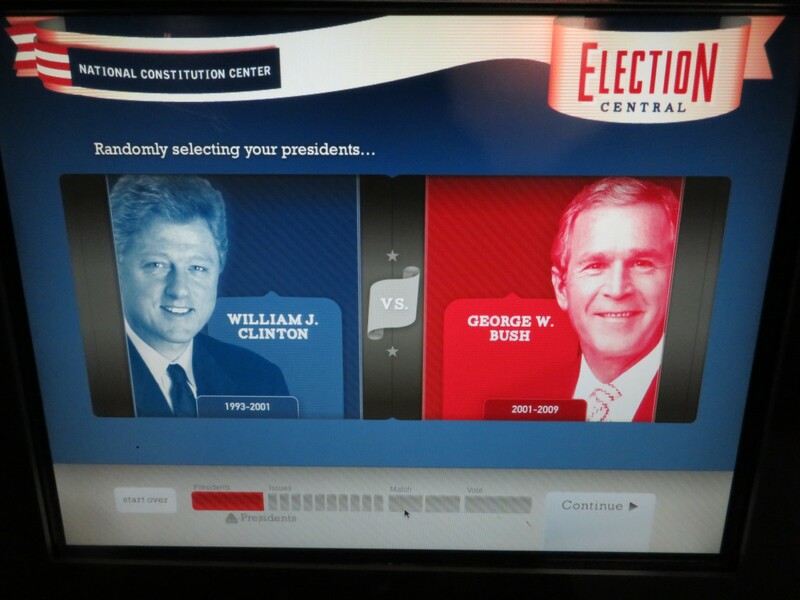 To engage visitors and immerse them in the experience — even those who can’t legally vote for real, such as kids — they have an entire fantasy election system set up. 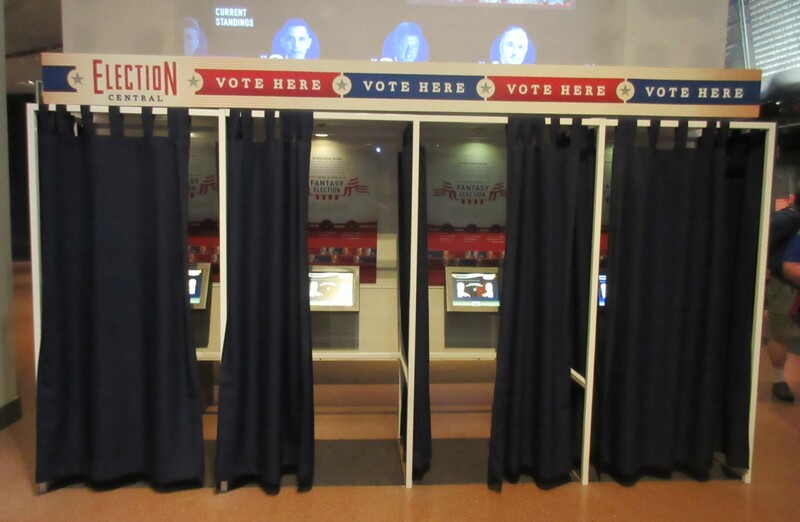 Voting booths maintain privacy for the sake of the integrity of these fake elections. The fake voting machines toss up two random Presidents and let fake voters fake-vote for the most awesome or least loathsome between the two at hand. Projectors share the results overhead, presumably not altered by fake Russian hackers. 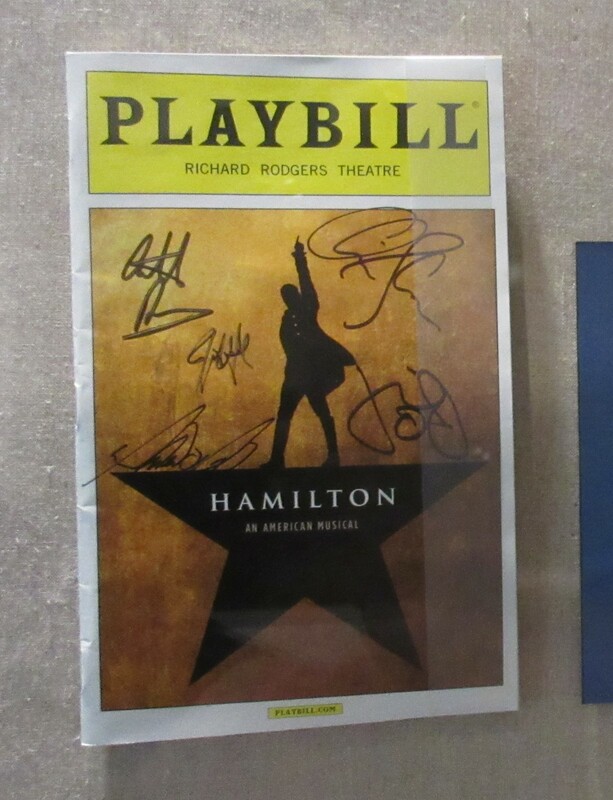 As a special added bonus at the time of our visit, the Center featured a temporary exhibit starring Broadway legend Alexander Hamilton, one of the Constitution’s 39 signers and a member of the Constitutional Convention’s Style and Arrangement committee. 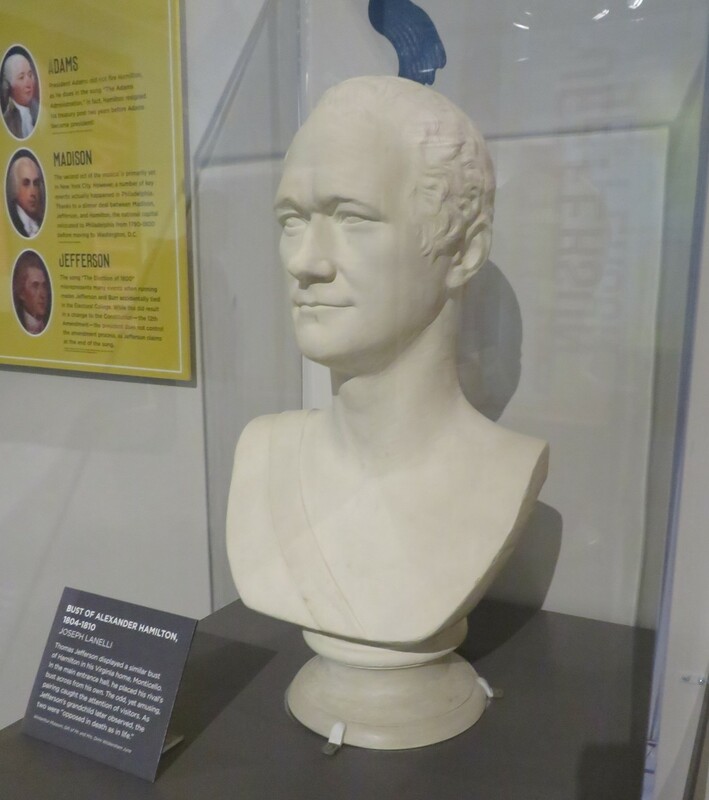 A Hamilton bust sculpted in the 1810s by Italian artist Joseph Lanelli. 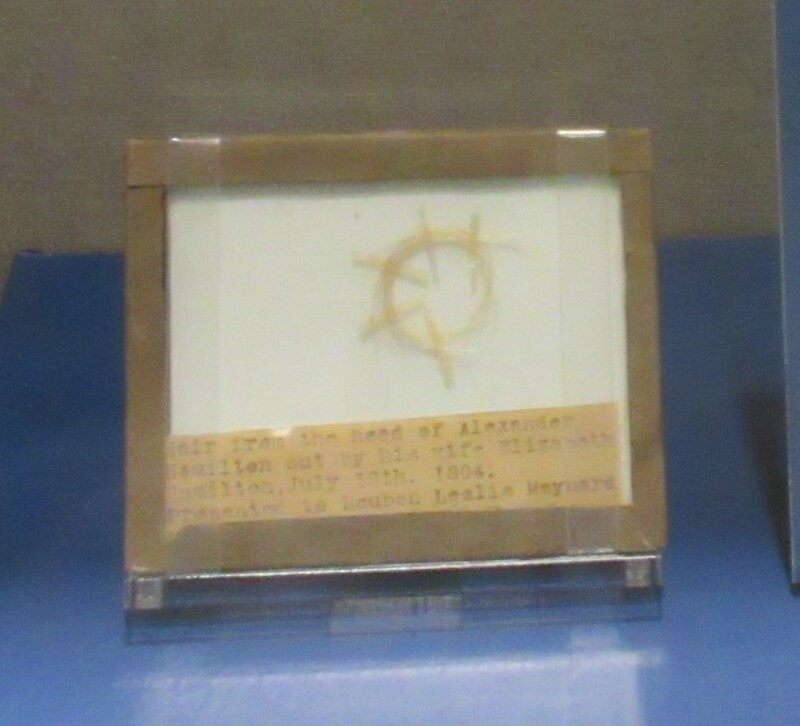 A lock of Hamilton’s hair, trimmed in 1804 and saved by his wife Eliza for decades after his death by dueling. 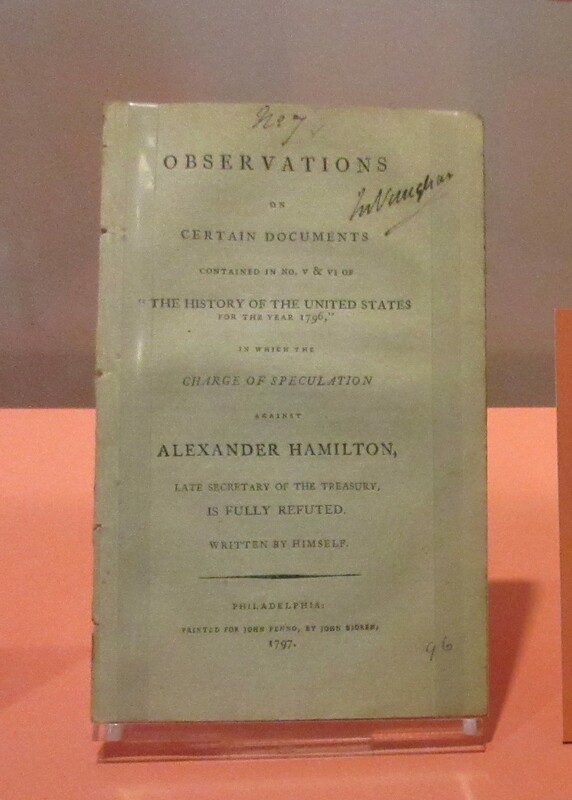 A 95-page book written in 1797 by Hamilton to defend himself from accusations of corruption. Part of his defense relied on confessing to adultery in deep, intimate detail including a 58-page appendix that’s just love letters from his affair. Obviously the most important relic on the premises. 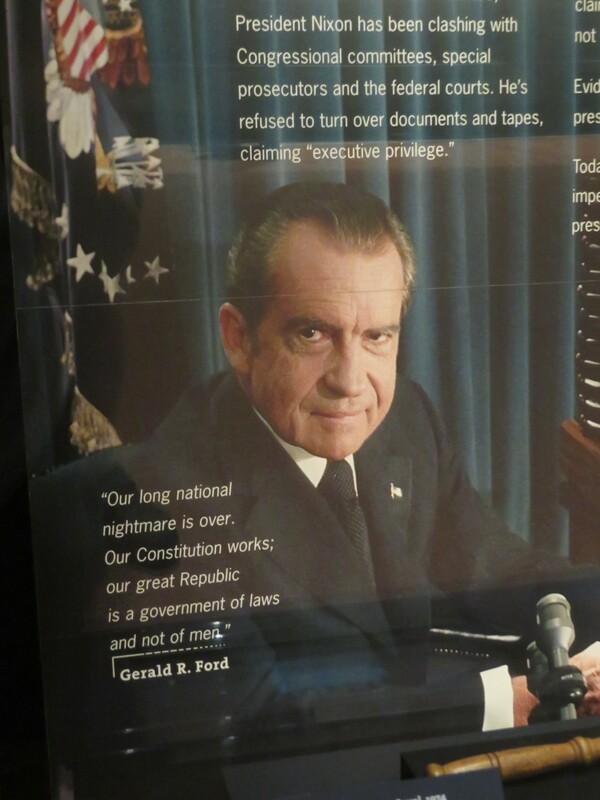 Nixon’s eyes follow you everywhere and threaten to pierce your very SOUL.